Our young anglophile even weaves in a zinger in the form of a character named Menzies. So very few people know how that’s pronounced. (Kind of like “zinger.”) Mostly people who wouldn’t pronounce a postvocalic R if a gun were pressed against their temple. If this thing is a bastardization of British English written by a Canadian who in turn is a traitor to his dialect, why is the whole book rendered in American spelling? The type, more or less competently handled for a change (designer: Barbara M. Bachman), uses a face that works only in a printing technology from two centuries back. (That era is about right for the book’s subject, newspapers.) But the typesetting interferes all by itself from time to time, as in the book’s opening words: LLOYD SHOVES. Is that like orange groves? Who, then, was the editor or editrix? Rachman credits Susan Kamil, clearly old enough to know better, for a “wisdom and deft touch” – complete hands-off approach? hitting Print on the delivered manuscript? 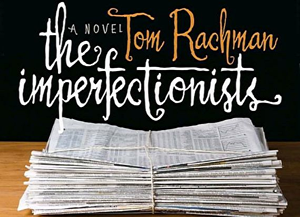 – that “helped make The Imperfectionists that much less imperfect.” Not much less enough.